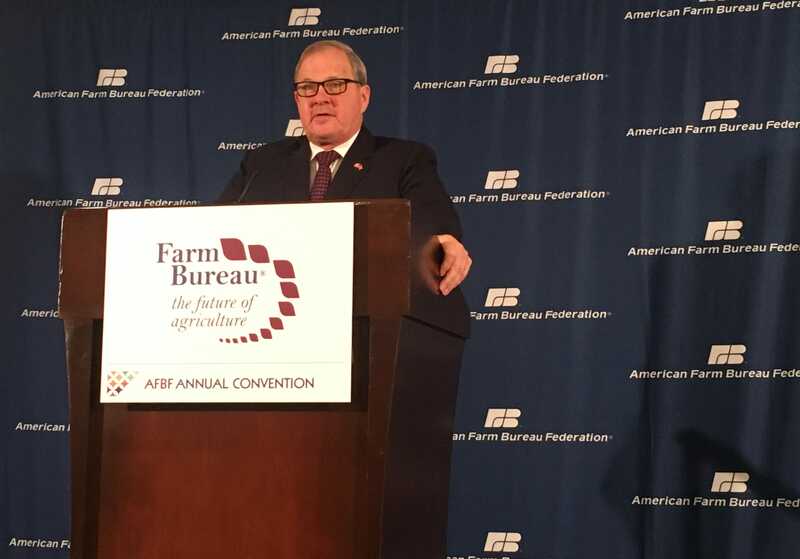 Agriculture and Agri-Food Canada Minister Lawrence MacAulay spoke at the American Farm Bureau Federation convention in Nashville Sunday, Jan. 7. 2018. NASHVILLE â" Lawrence MacAulay, Canada's agriculture and agri-food minister, said Sunday in Nashville that he felt the mutual hope across North America is that President Trump's North American Free Trade Agreement negotiations won't "break something that's not broken." The president has threatened to pull out of the 20-year-old trade agreement with Canada and Mexico, the Unite d States' second and third largest trade partners respectively, saying at times the country is not getting a fair deal. But many in the agriculture sector have voiced concerns that placing the profitable agreement in jeopardy is particularly dangerous now given the industry's slimming profit margins and that international trade has kept many farmers afloat. "Iâm certainly pleased the president is coming here, thatâs a good sign," said the foreign minster of Trump's planned visit to the American Farm Bureau Federation's annual conference Monday. "The U.S. trade to Canada and Mexico has quadrupled with the three countries combined, and the word is, not only with politicians, but with farmers and business people right across North America, is be careful not to break something thatâs not broken." MacAulay spoke during a news conference at the Gaylord Opryland Resort & Convention Center Sunday followed by American Farm Bureau Federation President Zippy Duvall. Many farmers hope Trump's discussions with them during the conference will be an opportunity for him to hear their concerns on the two issues they deem most important: trade and immigration reform. The president has so far been a hardliner on both of these subjects, but Duvall said he thinks Trump, as a business man, will do what's best for the country's bottom line. "I think this man is a business man, and he understands that our American companies, including American agriculture, has to be able to move their products and 95 percent of the population lives outside of our country, "he said. "I think he has his way of going about negotiating and he has the best interest of the American people, and the American farmers and ranchers, at the heart in trying to accomplish that." He plans to thank the president for his agriculture appointments and tax reform that have been beneficial to farmers, then launch into farmers' anxieties over trade and immigration..
"If he can share a word or two to give (the farmers) something to hang on to and have some confidence in what we are doing because none of us really know whatâs going on behind closed doors," Duvall said. "All we know is that this president told me in a group of 15 farmers in the Roosevelt Room that we were going to be happy with what came out of (the NAFTA negotiations)." President Trump is scheduled to speak at the convention around 3 p.m. Central time Monday, after U.S. Agriculture Secretary Sonny Perdue around noon.